The Taj Mahal (literally meaning the Crown of the Palace) is a beautiful mausoleum located on the south bank of the Yamuna River in the city of Agra in Indian State of Uttar Pradesh. This beautiful ivory-white mausoleum attracts 7 to 8 million visitors every year from all around the world. The exceptional beauty and stunning architecture of the monument never fail to lure the visitors coming from different part of the world. The Taj Mahal, India’s start tourist attraction and one of the most visited monuments in the world, was constructed by the Mughal Emperor Shah Jahan in the loving memory of his most darling and chief wife Empress Mumtaz Mahal to house the tomb of the empress. The Taj is often referred as the Love Monument of the Symbol of Love. Spread in the centerpiece of a 42 acre centerpiece complex, the tomb consists includes a mosque and guest house. Bounded by beautiful gardens on three sides by a castellated wall. The construction of the magnificent Taj Mahal was commissioned by the Emperor Shah Jahan in 1632 and it completed in 1653. 20,000 artisans worked to complete the mausoleum under the guidance of a board of architects led by the court architect Ustad Ahmad Lahauri. It is said that about 32 million rupees expended to build this beautiful architectural wonder. The Taj Mahal is a UNESCO World Heritage Site. It is designated as the World Heritage Site in 1983 for being “the Jewel of Muslim Art in India and one of the universally praised masterpieces of the world’s heritage”. Nobel laureate Rabindranath Tagore had described it as “the tear-drop on the cheek of time”. Regarded by many as the best example of Mughal Architecture and a symbol of India’s prosperous history, the magnificent Taj Mahal was declared a winner of the New7Wonders of the World (2000-2007) initiative. When you will visit the Taj in India you will be amazed by its beautiful architecture and design. You will see a fine amalgamation of Persian and Mughal architecture. Built in pure white marble the beautiful of the Taj will never fail to lure you. Both exterior and interior decoration is superbly done and will amaze you for sure. Decorations are among the finest in Mughal architecture. Interior decoration is done with use of semi-precious and precious gemstones. Apart from the architecture and design of the Taj Mahal, the garden with reflecting water pools will also lure you. The beauty of the Taj Mahal especially at Sunrise and Sunset as well is simply beyond imagination, and will never let you down. The Taj Mahal is closed on every Friday. Photography and videos are permitted by you cannot take snaps and videos inside the mausoleum itself. 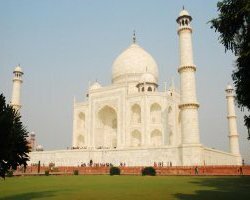 So, on your Agra and India visit don’t miss the opportunity to the Taj Mahal, one of the most beautiful monuments in the world. Seeing the Taj and exploring attractions within the complex will give you an unforgettable experience.